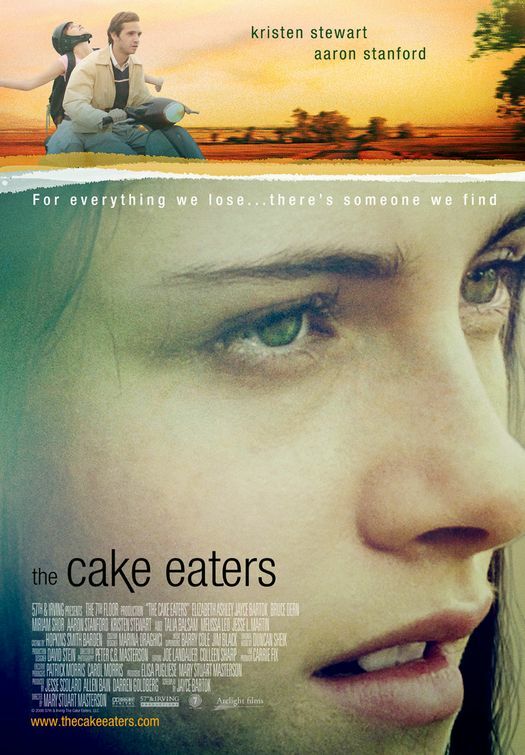 Although it came out in early 2009, I finally got a chance to watch The Cake Eaters starring Kristen Stewart the other night. It was a really surprising movie and I was so impressed with Kristen’s acting in this one. There are these moments, like in Into The Wild and Adventureland, where you can see her raw talent – this movie is a must see for KStew fans. The Cake Eaters, directed by Mary Stuart Masterson tells the story of two somewhat broken families and how their lives mix in unexpected ways. Kristen plays “Georgia,” a girl suffering from a terminal illness that causes a disconnect between her brain and body’s muscles. Kristen does an amazing job of becoming Georgia because you feel for her instantly. Then there’s Aaron Stanford who plays “Beagle” in the movie. He’s struggling with the recent death of his mother and you can tell me feels like a bit of an outcast in their rural community. Without completely rehashing the plot, Georgia and Beagle connect and find that they’re both a little but different but looking for the same things in life – something real and meaningful, and to experience what it’s like to love someone. The Cake Eaters is kind of beautiful in its simplicity. It isn’t trying to beat you over the head with the boy meets girl romance we have all seen and heard of a hundred times. Everyone in the movie is struggling with something and I like that because it mirrors real life. We all feel burdened in some way whether it’s physically or emotionally. The dialogue is minimalist and the actions of the characters seem to speak louder than their words. Probably the best thing about The Cake Eaters is that you see Kristen start out as a character fighting to find her voice and live her own life. By the end of the movie, she is living for herself and doing what makes her happy. I liked that about the movie, and the portrayal of that message felt genuine.